The Oklahoma City Thunder dug deep and conjured an absolutely necessary win in the fourth quarter of tonight's game. The Houston Rockets, owners of the best record in the NBA regardless of the rest of the season, conjured approximately nothing. The Thunder were running hotter than the Rockets all evening, and eventually the Rockets gave enough ground to be left behind. It wasn't the worst loss of the season, but with a national audience and a key rival in town, it was anything but a statement game. At this point there's nothing to do but to prepare for the west-coast back-to-back road trip the Rockets will make next week and get ready for the playoffs. This was the last game against a team that has a particular reason to win games, and moreover the last team that the Rockets have any real reason to care to beat. A win over the Thunder would have made them sweat if they would get into the playoffs at all, and been a bit of further revenge for an unpleasant loss to the Thunder on Christmas day. 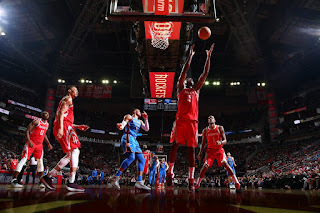 Instead, the Thunder go up 2-1 on the Houston Rockets for the season, and end it with a margin of 1 point over the Rockets in those three games. This game boiled down to three statistics. 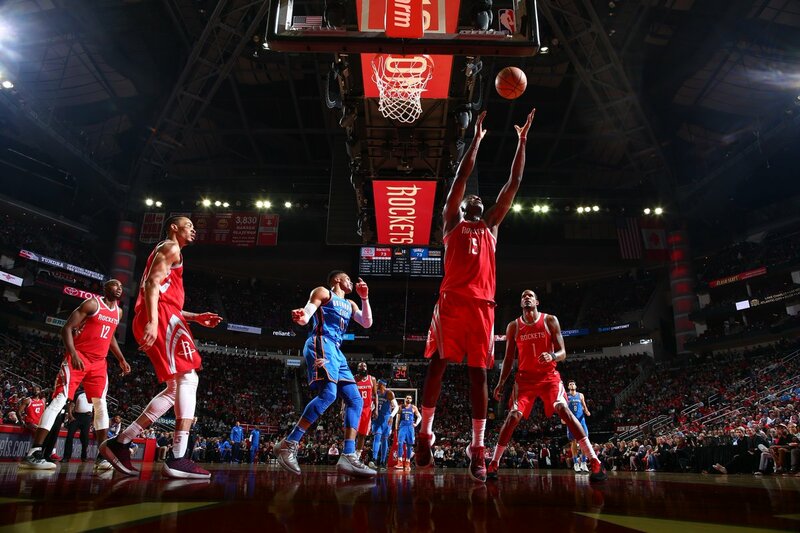 The Thunder shot the ball 15 times more than the Rockets did, had 15 offensive rebounds to Houston's 6, and gave up 12 turnovers while the Rockets coughed up 17. Offensive boards are often a strong indicator of effort disparity, and tonight featured a Thunder team fighting for their playoff lives. The turnovers were in large part a factor of a crushing Thunder defense versus a Rockets team missing a key offensive engine in Eric Gordon. OKC keyed in on Harden in particular late in the game, and generally went to extra effort to deny him any sort of leeway on offense. James, of course, didn't lose quietly. He scored 26 points on 16 shots to go with his 4 rebounds and 9 assists, but his 5 turnovers didn't help anything, and he went for long stretches without scoring or even putting up a shot attempt. Unless the Rockets have some more effort and some more tricks up their sleeves in the playoffs, they look vulnerable. Thankfully for them, they definitely have those in stock. This was an ugly game throughout in which neither team could get into rhythm, and that favored the Thunder and their one-man offense. Tonight, that one man was helped by 22 points on 50% shooting from Carmelo Anthony, which was all Westbrook needed to get the win. He may have taken 28 shots to get his 24 points, but he was a force of nature on the court, something which doesn't always work, but did tonight. A sloppy, rough game will always favor the Thunder, and they got their wish. The officiating, it should be noted, was utterly unpredictable and atrocious. There was neither rhyme nor reason to the pattern of missed calls and confusing technicals, and didn't so much favor one team as give everyone on Earth reason to be mad at Zach Zarba, et. al. It was, in all possible ways, a mess of a game.